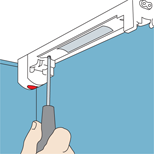 Summary: Learn how to install worktop strip lights and fit mains-supplied strip lighting. Unlike traditional tungsten filament lamps, fluorescent lighting uses particle movement to illuminate the coating on the tube. This type of lighting is energy-saving and produces more light per watt than tungsten light bulbs without generating heat. Fluorescent tubes are available in various sizes and shapes, including bulb shapes for lamps. This is a non-notifiable project providing that CE-approved kits are used and that the strip light is not installed in a bathroom or wet area. You can mount strip lights under a kitchen unit to illuminate a worktop or provide atmospheric under-lighting without wiring the lights into the main circuit by simply plugging them in to a nearby socket. Position the lights on the worktop roughly every 500mm (19½in). 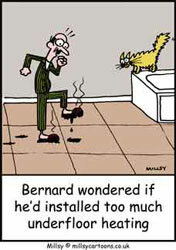 If there is no convenient socket within reach of the flex, follow instructions for installing sockets. Mark the position of the lights on the underside of the kitchen units to give you a mark to line up the back of each fitting with. The lights should be at least 50mm (2in) away from the wall. Hold the base-plates in position and mark the screw holes with a pencil or bradawl. Drill pilot holes for the base-plates and fix them to the units with the fixings supplied. With all the base-plates fixed in place, plug the cables connecting the fittings into the outlet sockets in the base-plates. Keep any excess cable tucked away by securing it with self-adhesive clips supplied. Fit the tubes and covers onto the base-plates. Hide the wiring with a strip of decorative moulding or trim fixed to the bottom of the units with panel pins or adhesive. Drill pilot holes for the base-plates and fix to the units with the fixings supplied. You can hide the wiring with a strip of decorative moulding fixed to the bottom of the units. This is a notifiable project requiring Building Control approval if installation is located in a kitchen, bathroom or other special location or does not use CE-approved fittings. Run a spur from the lighting circuit, following the instructions for extending lighting circuits. If you wish to install a separate switch for the light fitting, follow the guidelines for running a spur from a junction box. Hold the light fitting base-plate in position over a joist or wall stud and mark the screw holes. Drill and plug the holes and screw the base-plate to the wall or ceiling. Feed the spur cable into the light fitting. Prepare the cable and cores, insulating bare earths. Connect the spur cable cores to the connector block in the light fitting: connect the 2 live cores (red/brown) opposite each other; 2 neutrals (black/blue) opposite each other and the earths to the earth terminal. If there is no earth terminal, terminate the earth core in a plastic terminal block. Screw on the covers and shade or baffle. 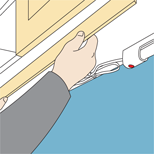 If you have laid the cable for a separate switch ensure the power supply to the relevant circuit from the consumer unit has been cut off. Prepare the ends of the switch cable. Place a piece of brown insulation tape around the blue core on the switch cable to label it as live. To connect the switch cable at a four-terminal junction box: connect the live (brown) core from the flex or lighting fixture and the brown-tagged blue core (tagged live) from the switch cable to one terminal; connect all the remaining live (brown/red) cores to one terminal; the neutral (blue/black) cores to another terminal; and the earths to the last spare terminal. To connect at a three-terminal junction box simply connect lives, neutrals and earths to one terminal each. At the switch, connect the other end of the cable to terminals in the face-plate: live core to the top terminal marked TOP or COMMON, neutral core either of the bottom terminals and earth to the earth terminal in the switch mounting box. If you wish the light fitting to be controlled by an existing switch, replace the existing switch with a two-gang switch. Connect the new switch cable to the first gang and the original switch cable to the second gang in the same way as for a separate switch.